Build the eastern bluebird birdhouse with red cedar, pine, or almost any soft wood. Use wood rough-cut on both sides so that birds can grip both interior and exterior surfaces. Make a 4″ by 4″ floor (inside dimensions) and 9″ floor to ceiling height (inside front). Drill a 1 1/2″ diameter entrance hole located 7″ above the floor (to top of hole). Drill or cut ventilation openings in the floor and under the roof. Mount bluebird houses 3′ to 6′ high in partial sun and shade on posts in woodland clearings, grove and shelter belt edges bordering fields, among scattered trees, or pasture fence lines. Make a “bluebird trail” of several houses about 100 yards apart. Place them further apart in wide open expanses. Mount bluebird houses closer in clearings of wooded areas. In areas where the eastern bluebird range overlaps that of the mountain bluebird, use the larger nest box for mountain bluebirds and western bluebirds. This birdhouse will accommodate all three bluebirds. See range maps and more information on each bluebird species page. Place tree swallow nest boxes between bluebird houses. This invites good neighbors that will help defend against sparrows. But these bird houses also invite house sparrows, so monitor the swallow houses as well as the bluebird houses. 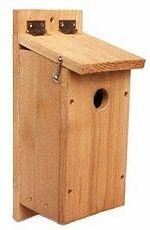 Chickadees, nuthatches, titmice, wrens, tree and violet green swallows and house sparrows may also use this next box. Mount bluebird houses 3′ to 6′ high in partial sun and shade on posts in woodland clearings, grove and shelter belt edges bordering fields, among scattered trees, or pasture fence lines. Make a “bluebird trail” of several houses about 100 yards apart. Place them further apart in wide open expanses. Mount bluebird houses closer in clearings of wooded areas. Chickadees, nuthatches, titmice, wrens, tree and violet green swallows and house sparrows may also use this box.